Ever since Slo-mo-shun IV, a daringly new kind of Gold Cup hydroplane, made her bellowing debut five years ago, Seattle has been the capital of the noisy, spume-hung realm of marine speed, and Stanley M. Sayres, her wealthy owner, has been its undisputed monarch. Slo-mo was the first of the monster "prop-riders" -- aerodynamic curves were built into her hull, her engine was pushed forward to keep her stern high, and at racing speeds she became partially airborne and skimmed with but a few square inches of forward sponsons and only the lower half of her propeller arc in the water. Alarmingly free of drag, she hit a world record of 178 mph; with her newer sister, Slo-mo-shun V, she has kept the Gold Cup year after year against all assaults. But last Sunday, while a quarter of a million hopeful partisans crowded up along miles of Seattle's sun-drenched, fir-framed Lake Washington, the reign of Stanley Sayres and the Slo-mos came to a dramatic end and the Gold Cup went back to Detroit. It was blinding speed which did the bright red Slo-mos in -- speed which made the 1955 gold Cup the most hair-raising as well as the most curious on record. Slo-mo V hit a gust of wind at 165 mph while qualifying, became completely airborne, looped 50 feet above the water and was wrecked; Slo-mo IV fell out two laps short of home and victory with a blazing engine, leaving a hot new Seattle boat, orange-hulled Miss Thriftway, winner of two of the race's three heats. But it was poker-faced teamwork by frustrated Detroit owners which won the race. Just before the last heat they held a hurried shoreside conference and agreed to send trailing, twin-engined Such Crust III out as a blocker for their only hope, Gale V, which had been second in the first heat, second in the second and which eventually was third in the final 30 miles. They had good reason: under Gold Cup rules the boat with the fastest average for the full 90 miles gets a 400-point bonus. The jubilant Seattle crowds started home, certain that Miss Thriftway, owned by Willard Rhodes, Northwest grocery executive, had guaranteed another Gold Cup race on Lake Washington next year. But Miss Thriftway had run one slow heat -- the first -- and in the third Such Crust had blocked her on the turns for laps, slowing her times. An hour after the race was over the timers made a startling announcement: Gale V, owned by Joe Schoenith, Detroit electric supply contractor, and driven by his chunky 28-year-old son Lee, had run the 90 miles 4.53 seconds faster than the new Seattle boat and was the winner. Gale V had never been in real contention with either Slo-mo or Miss Thriftway as they gave thundering expression to the enmity which now exists between Designer Ted Jones (creator of both boats) and his former friend and confidant, Stanley Sayres. Slo-mo had left the winner behind in setting a new lap record of 107 mph and a new heat record of 103.159. But Gale V, though she had trailed throughout the race, nevertheless ran the 90 miles faster than it had ever been run before: an average 99.526 mph. Her record time gave statistical expression to the fierceness with which the battle was fought, and in a way her curious victory seemed only fitting. Seldom if ever in the history of the Gold Cup had race day approached amid such an atmosphere of tension, danger, acrimony, valuting ambition and vaulting local pride. From the day the gleaming, deadly big hydroplanes -- the heavyweights of speedboat competition -- were trucked into Seattle it was evident that in 1955, for the first time, the Slo-mos were in for a genuine fight. Designer Jones had lent his genius to the construction of three new boats, well built on Slo- Mo lines and principles -- his own boat Rebel Suh, Miss Thriftway and Guy Lombardo's new Tempo VII. He was grimly bent on humbling Sayres -- Rebel and Thriftway operated and were serviced as a team and during the year he had also lent a hand at modifying many of the Detroit boats, among them Gale V. The Detroit owners were also sick to death of humble pie. They were humanly envious of the fact that Greater Seattle Inc. -- an organization which has annually promoted tourist- pulling, carnival-like Seafair Week in conjunction with the Gold Cup races -- has contributed more than $30,000 a year toward the maintenance and operation of Sayres' Slo-mos. Almost from the first day of tests and warmups it was also evident that speeds were due to rise to startling levels. Both Slo-mos had new Rolls Royce aircraft engines rated at 1,650 horsepower. Most of the other boats were powered by 16-cylinder Allisons, rated at 1,150. But in both cases engines were hopped to the bursting point -- the Allisons, designed to turn 2,800 rpm in an airplane, were being pushed to 3,500 rpm and sometimes close to 4,000 by tremendous supercharging and were delivering 2000 hp and progviding up to 170 mph in the stretches. It seemed almost certain that there would be a big field -- perhaps as many as 12 boats. Referee Melvin Crook of Montclair, N.J., a New York businessman and an editor of Yachting magazine, felt a nerve-straining concern for the safety of drivers as he watched daring, lighthearted Danny Foster qualify Lombardo's Tempo VII at a record 116.8 mph and then saw bespectacled Joe Taggart of Canton, Ohio, top him in the Slo-mo-IV with 117.391. Both men were coming into the turns at 130 mph. Steering an all but airborne Gold Cupper is not merely a matter of turning the steering wheel -- enormous torque pulls them eternally to the outside and after they begin their swing it is often necessary to fight them with throttle and an opposite rudder to keep them on course. The key to Referee Crook's worry was Slo-mo V and her passionately competitive driver, Lou Fageol. 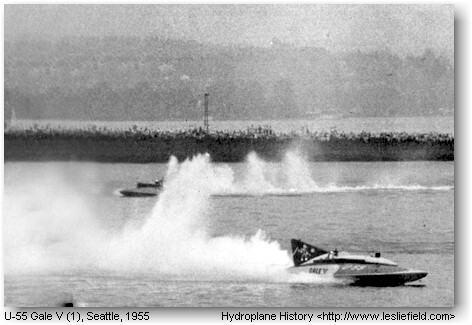 In earlier Gold Cups, Fageol had made a practice of retreating north under the narrow approach arch of Seattle's famed Floating Bridge before heats, lurking there hidden by the concrete bastions of the bridge itself and then hurtling into view at 150 mph, zooming past boats milling toward the starting line and taking the lead with rocketlike authority. Twice this "flying start" had almost caused disaster, but the Detroit owners talked openly of setting up a defensive block to stop it. In midweek, Referee Crook banned it. Stan Sayres, a man in whom shyness and arrogance are curiously combined, hit the ceiling. He invited Crook to dinner at his handsome, lawn-bordered Hunts Point home -- a house which sits just above a lakeshore boathouse and machine shop in which the Slo-mos are kenneled. For hours, with Driver Fageol and Seattle Yacht Club officers, he insisted that the ruling be rescinded. Crook refused. Next day Crook was told by a high-placed Seattle citizen that if he continued to refuse, Sayres would pull out his boat (an allegation Sayres later denied with vehemence). The morning after that, rebeling at the pressure, Crook resigned. He was replaced with Stanley Donogh, an executive of Sears Roebuck in Seattle. Donogh announced he would rescind the rule. Six Detroit owners and then New York's Guy Lombardo threatened to walk out on the race themselves. Driver Fageol's near-tragic mishap with Slo-mo V -- in which he miraculously escaped death but went to the hospital with broken ribs and spinal injuries after averaging 124 mph for two and a half laps -- indirectly ended the argument. The flying start was banned and Sayres announced that he was through with racing after 1955. But tension mounted hour by hour as the gleaming, high-finned, roaring boats hurtled through tests on the lake and as mechanics toiled round the clock to repair the awful mechanical attrition caused by strains on bearings, shafts, propellers and power plants. At five minutes to one on race day it reached a peak. A dreamy silence lay over the miles of humanity packed along the shore of the smooth blue lake, over the thousand yachts and cruisers moored side by side for miles around the course, over green hills and headlands which stood up against the blue summer sky beyond them. The silence was broken by a growing thunder. One by one, 10 hydroplanes were floated, one by one their exhaust stacks coughed, belched smoke, rubmled and one by one they began a slow jockeying for a position from which they could accelerate to the start. Time passed slowly, achingly. Then suddenly the mass muttering became a brazen, bull-like bellowing, and 10 sinister shapes came hurtling south down the lake, dwarfed by the enormous lashing white curtains of water flying behind their sterms. A flash of yellow, of red, of mahogany, of blue, of orange -- then what looked like high moving fountains marched off into the distance in uneven formation. The race was on. The applause began rolling down the shoreline -- Slo Mo IV, the red boat, the boat which could keep all this grandeur for yet another year, was speeding into the lead. The flying curtains of white water became fewer almost immediately. As Danny Foster hit the north turn in Lombardo's Tempo VII the cover of his gasoline tank broke. A gout of gasoline sloshed out, touched the exhaust stacks, became a bright billow of searing flame. He ducked and chopped his throttle, the fire went out and he sat up again, out of the race and with a badly burned right arm. Henry Kaiser's Scooter II [sic - Scooter Too] hit some drifting debris, filled and sank almost immediately. But Slo-mo hurried on, eight times around the three-and-three-quarter-mile course and then took the checkered flag. Next time out, Slo-mo attempted to hug Gale V, hottest competition in the first heat, at the start and fell irrevocably behind. But orange Miss Thriftway, driven by chunky young Bill Muncey, burst into the lead and kept it to the end with an average of 100.944 mph. All around the lake the crowds breathed more easily; two Seattle boats were now tied with 625 points, and Detroit's threat to steal away the bauble of civic pride seemed remote and pale. But back at the pits, Detroit's trailing owners and drivers were gathered in emergency session around young Lee Schoenith, driver of Gale V.
"I haven't got a chance," said Schoenith, "unless I win the third heat. I'm gonna win." "Yeah," cried his teammate Bill Cantrell, "quit coasting!" But George Simon, dark-haired owner and driver of Detroit's Miss U.S. -- which was out of the race with a broken supercharger shaft -- had another idea. figuring intently with pencil and pad he arrived at the conclusion that Gale V's average speed might be much closer to that of either Seattle boat than anyone believed. He eyed Detroit Bakery Man Jack Schafer, a broad-shouldered, jovial man who looks for all the world like the captain of a tramp freighter. Schafer pushed back his white yachting cap and beckoned to Walt Kade, a 51-year-old Packard Motor Co. engineer who drives his big, twin engined Such Crust III. As Kade walked up Simon said: "You gotta block that IV, even if you go over the line too soon. You've got nothing to lose, and if it works we'll have the cup back in Detroit." Kade shrugged. But as the field ran for the start of the third and crucial heat Such Crust was hugging the pole in front of the pack -- and Detroit's Miss Cadillac was running exactly parallel off to her right. The maneuver failed -- Joe Taggart gunned Slo- Mo between the two with a terrific burst of acceleration, burst in front and fled for the south turn, opening water on the field. But Such Crust, rolling ponderously in second, was to find other work to do before the race was over. Miss Thriftway, off to a bad start and last in the field of six, began one of the most amazing stern chases in Gold Cup history. Driver Bill Muncey threw her past Breathless, Miss Cadillac and Gale V and was challenging Such Crust for second after little more than a lap and a half. He did not get past -- Such Crust bounced wide on every turn. But he stayed close, so close that he hid in the spray of Such Crust's roostertail to keep Such Crust's Driver Kade from knowing his exact position. Finally, on the fifth lap, Kade came up behind slow-running Breathless and Muncey tore out of hiding, gunned past both and set out for Slo-mo. "I hid in his tail too," he said afterward. "I figured Taggart wouldn't know I'd passed Crust and wouldn't be expecting anything. Then I went out and passed him -- I saw him look over at me and really jump. Well, he stood on the throttle to pull her up and his engine caught fire." That was the end of the boat race -- Slo-mo went dead in the water as Taggart worked with a fire extinguisher and Muncey took the checkered flag, waving jubilantly to the applauding tens of thousands on shore. He cut his engine, drifted slowly to the crowded official barge, and climbed out -- to weep, to embrace his pretty wife, to be mobbed by his maintenance crew, to be cheered, photographed, thrown into the lake and even -- ah, stern and trying moment -- to be kissed by ex-Heavyweight Champion Max Baer. But Such Crust's delaying tactics had cost him precious seconds. An hour later, after most of the crowd had gone home certain that he had won, the timers announced the official winner. "You did it, Jack," cried jubilant Detroiters as Baker Man Schafer received the news. "Thank you," said Jack. "Thank you." He smiled broadly. After a moment he smiled again.